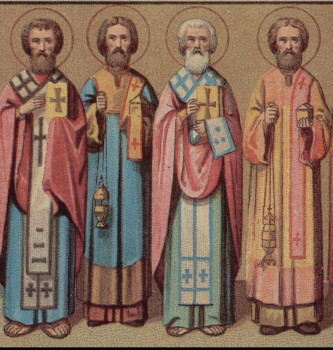 The Holy Disciples from the Seventy: Prochorus, Nicanor, Timon, and Parmenas were of the first deacons in the Church of Christ. In the book of the Acts of the Apostles (6:1-6) it relates that at Jerusalem the twelve apostles chose seven men: Stephen, Philip, Prochorus, Nicanor, Timon, Parmenas and Nicholas, full of the Holy Spirit and wisdom, and established them to serve as deacons. Holy Church makes their memory in common on 28 July, although they died at various times and in various places. Saint Prochorus at first accompanied the first-ranked Apostle Peter and was made by him bishop in the city of Nicomedia. After the Dormition of the Most Holy Mother of God, Prochorus was a companion and co-worker of the holy Apostle John the Theologian and together with him was banished to the island of Patmos. There he wrote down the Revelation of God, revealed to the holy Apostle John, about the final fate of the world (Apocalypse). Upon returning to Nicomedia, Saint Prochorus converted pagans to Christ in the city of Antioch and there accepted a martyr’s end. Saint Nicanor suffered on that day when the holy First Martyr Stephen and many other Christians were killed by stoning. Saint Timon was established by the Apostles as bishop of the city of Bastoria in Arabia and suffered from the Jews and pagans for preaching the Gospel. He was thrown into a furnace, but by the power of God he came out of it unharmed. The tradition of the Roman Church says that Saint Timon died by crucifixion on a cross. Saint Parmenas zealously preached Christ in Macedonia. He died from sickness befalling him. There exists also the opinion, that Saint Parmenas suffered under Trajan (98-117) in the final year of his reign, having accepted a martyr’s end.